Nearly Everyone Hunts For A Job On The Internet Today. The Internet has created a huge new hiring problem for human resource managers — QUANTITY. Instead of spending time and money interviewing and hiring the best people, they end up sorting through thousands of résumés, many of which are "one-click" applicants that may not be seriously interested in the position. There is also the substantial added burden of tracking all these "casual" job hunters in order to meet the new EEOC compliance guidelines. Hire Golden has turned this challenge of unlimited résumés into an unprecedented opportunity to screen the masses for The Very Best workers. Rather than running from quantity, we seek it out. we have developed the perfect selection tool for today's fast-moving recruiting world. Our Advanced Pre-Invite Selection Process eliminates 97% of the applicants before they ever become your candidates. By narrowing the field to only The Very Best, you only have to track the select few candidates that we recommend. With Hire Golden's process, no longer will you have to review endless stacks of résumés and be tied to the inefficient and slow ways of the past. "In the hands of the inexperienced, résumés are dangerous weapons." A resume provides only a one-dimensional view of a candidate—the experience. But most hiring executives agree that it takes 3 things to make a great hire: the Right Personality, the Right Talents, and the Right Experience. A resume provides just the Experience portion of that formula. 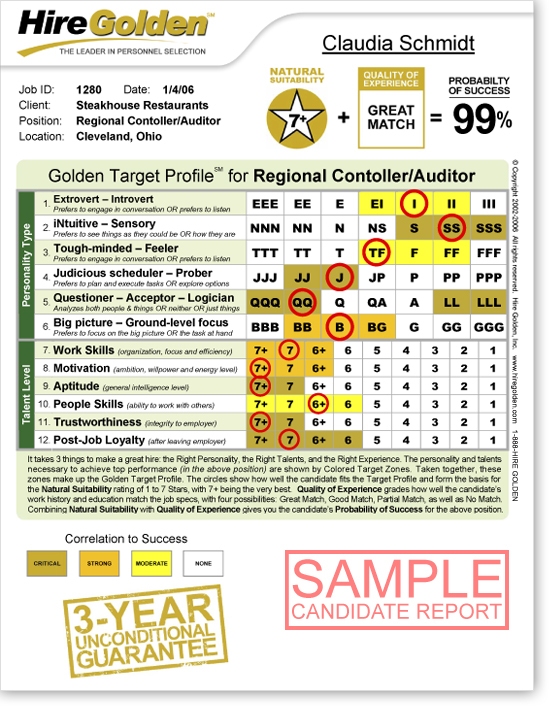 But Hire Golden evaluates every candidate for how well their personality, talents, and experience fit the target position. 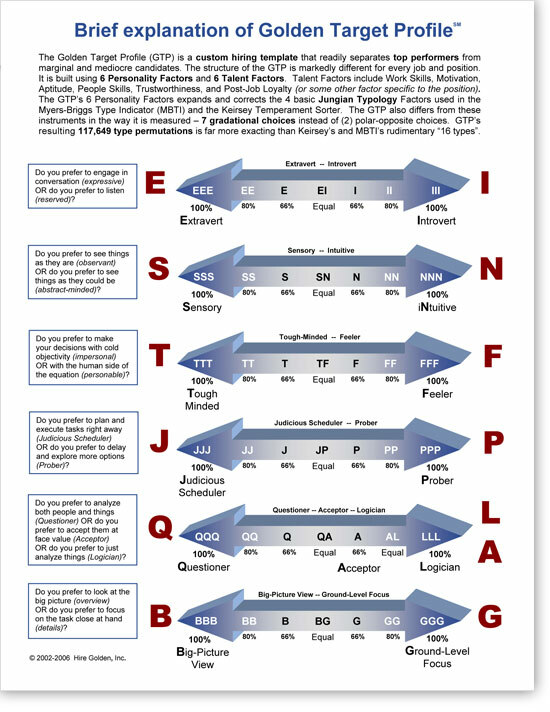 What is the Right Personality Type and what are the Right Talents necessary to achieve top performance? Every position has its own “profile” —a unique set of requirements for success . To consistently hire the very best, you must first identify what those requirements are and build a Custom Profile for each of your positions. Then, you must find top quality candidates who not only match the profile, but also have the Right Experience. Hire Golden has solved this seemingly impossible challenge. We have discovered a way to make a Custom Profile that strongly correlates with job success. We call it the Golden Target Profile. Over the past several years, we have field-tested and proven the efficiency of these profiles for most of the common positions. If we do not have a Golden Target Profile for your specific position, we usually can develop one by extrapolating from other proven Profiles which have similar responsibilities and duties. If the position is unusual or specialized to a niche industry, a new Golden Target Profile can be developed from scratch by evaluating your top performers in the position. The Candidate Report (see sample report below) is prepared for each recommended candidate. Through its “Probability of Success” rating, the Report indicates the likelihood the candidate will be successful if hired for your specific opening. 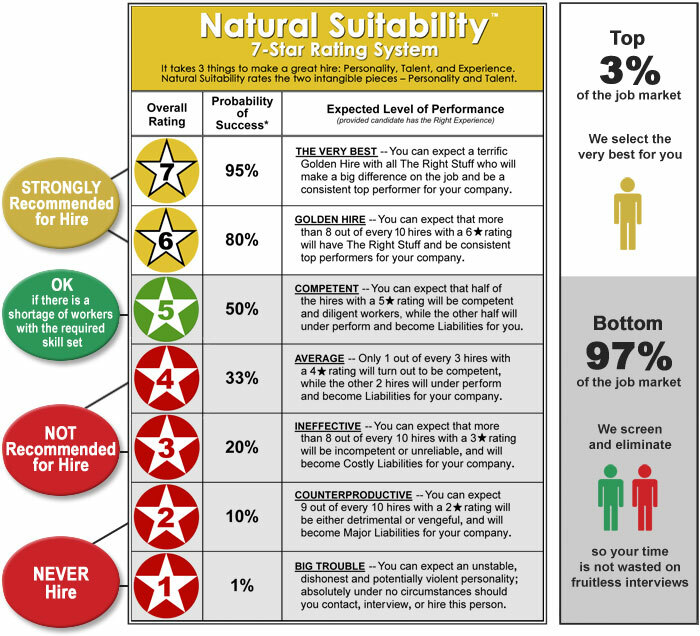 The Report also shows you how well the candidate fits the Golden Target Profile—the “Natural Suitability” rating—and how well the candidate’s experience matches your job specs—the “Quality of Experience” rating. You will not be wasting your time chasing around for "contact info." All the job candidates we submit to you will come with their full contact information: name, address, phone and email. This courtesy will help you streamline your hiring process. Once we've begun our recruiting process, you'll be able to track the results of our efforts through a user-friendly online portal. Each time a candidate is screened and rated a Golden Hire, we make their résumé and all of their contact information available to you online and an email is sent alerting you that additional candidates are available for review. 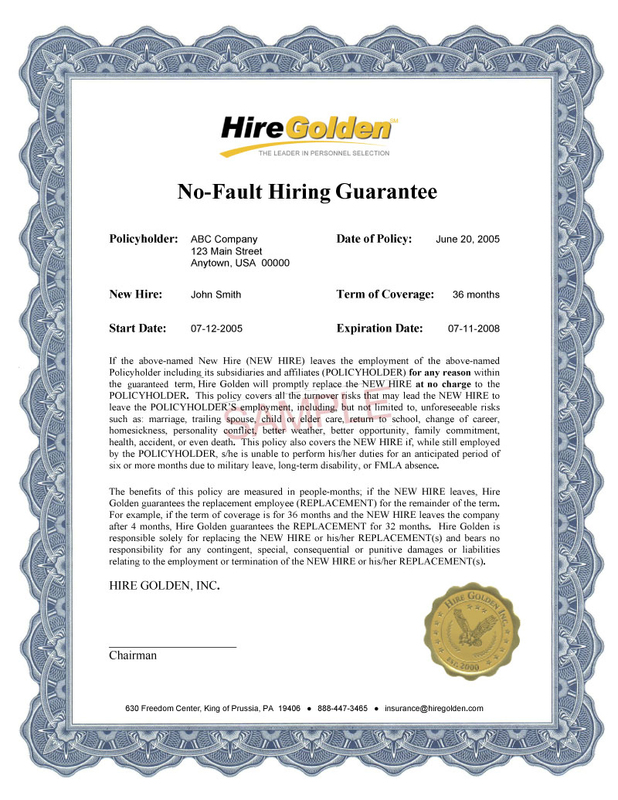 Each and every candidate comes with Hire Golden’s unconditional 36-month guarantee. 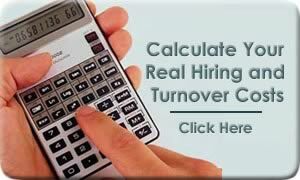 If, for any reason, one of our placements leaves your organization within 36 months, we will replace them at no charge. This includes the many unforeseeable factors that can cause a quality hire to leave your employ prematurely, such as marriage, trailing spouse, child/elder care, return to school, homesickness, extended military leave, health, accident, or even death. The best candidates have a short shelf life. They usually get hired within their first three interviews. So, it's not enough to be able to identify who the very best candidates are. You also need to have early access to them . . . preferably First Access. Due to the remarkable speed and efficiency of our process, you often will be first to interview the best candidates. Being first is a significant tactical advantage! Hire Golden is focused on filling your job order, not on placing people. All the candidates that we source for you are exclusively yours. We do not send them to anyone else . . . not even the rejected ones. Most recruiters, however, do just the opposite. Their focus is on placing people, not filling your specific job order. They shop their candidates around to as many employers as they can in order to maximize their chances of placing them. Exclusive candidates is a big tactical advantage! Due to past hiring mistakes, employers tend to discount the value of their prospective hires. For the same reason, they often spend too much time interrogating candidates during a job interview and too little time recruiting. Knowing who's good in advance lets you spend more time recruiting than interrogating. It gives you more confidence to make an aggressive offer. Advance knowledge is a huge tactical advantage! Employers with hundreds of locations have to rely on inexperienced local managers to do their hiring. This problem is compounded by "B" managers that intentionally hire sub-par workers to protect their positions. With our ability to find the best workers in any local market, anywhere, we can offer you a uniform hiring standard of excellence nationwide. Centralized quality is a great tactical advantage! Many employers lack sufficient diversity in the overall makeup of their work force to comply with the Title VII Civil Rights Act of 1964, and thus, are subject to costly disparity claims. Hire Golden has proven that when you pre-select the very best candidates in advance of the interview, you end up hiring both a highly talented as well as diverse group of workers. Hiring a top-notch workforce with diversity is a major tactical advantage! Considering all the possible exposures, the time to contain "termination risk" is before you make a hire. Hire Golden screens out unstable, dishonest, highly vindictive, and potentially violent personalities in advance of your interviews . . . before your identity is revealed. Hiring loyal and trustworthy workers is an extremely important tactical advantage! Copyright © 2000-2007 Hire Golden, Inc. All rights reserved.